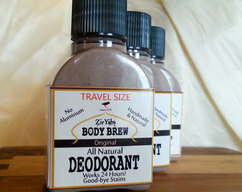 This is a small version (1.75 oz) of my popular deodorant. 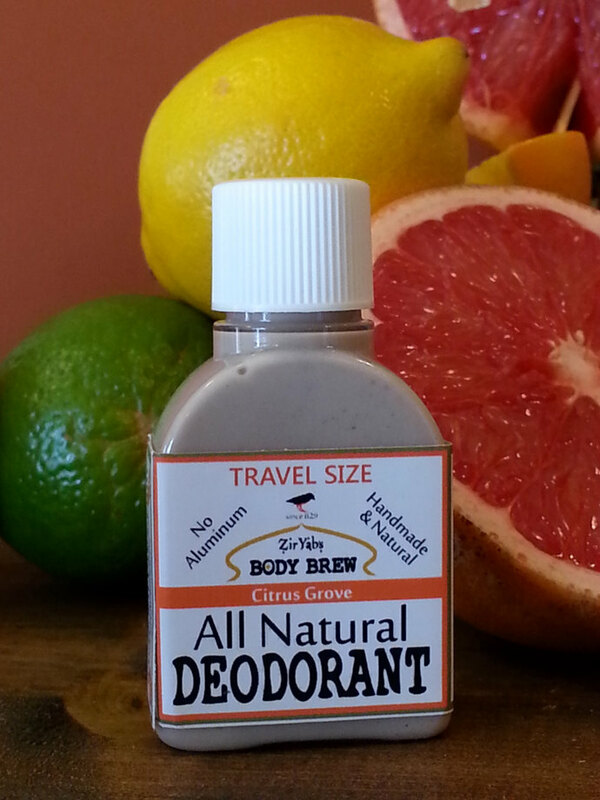 This Natural Deodorant is powered by citrus essential oils. It is a veganantipersiprant and is Aluminum Free no added aluminum. It is powered by pink grapefruit essential oils and other citrus essential oils and works for 24 hours in most situations. CHRIS SAYS "The best deodorant and best antiperspirant around ever! I haven't been able to find any natural deodorant that works and doesn't make me glands swell up, this is so much better than antiperspirant. My wife keeps smelling my pits and saying 'Yup, still working!' Thank you!!! Say goodbye to aluminum antiperspirant and hello to odor free underarms for 24 hours. No more yellow stains, no more body odor at the wrong time, no more worrying about that. This is the best deodorant I've ever used, never mind made myself! 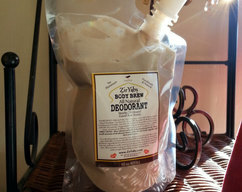 This is an all natural, vegan deodorant with no aluminum or alum salts. I make this in my small shop kitchen dedicated to my body products. I am as sweaty and stinky as anyone can be. So, when I first made my homemade deodorant and it worked, I couldn't believe it. It took me 18 months to test it in every situation and to give it to friends and family before I was sure... This stuff is a miracle and changed my life. Some of you who don't sweat as much as I do may think I am dramatizing but those who suffer from the kind of self-conscious concern about personal body odor that I do know exactly what I am talking about. If I wanted to continue my day after 8 hours without a shower, I'd bring a change of blouses. The commercial brands of deodorant worked at eliminating the body odor smell but replaced it with a smell that quickly turned from pretty to rancid under my arms. This smell of old deodorant was almost as bad as body odor. I knew anyone who got close to me would be able to discern the distinctive deodorant-gone-bad smell just as I can on other people. I lived a large part of my life self-conscious and worrying about the smell of my armpits. It was only after I was free from worry that I realized just what a huge burden it had been. In fact, I get a little bit passionate when I think of all those years of discomfort I endured that could have been solved by something as simple and healthy as my deodorant recipe. That's not to mention the years of exposure to all the chemicals they put into commercial antiperspirants. Even the so-called natural ones are full of ingredients meant to plug up your glands and make the stuff last until the new dawn. And I found that the commercial stuff worked its way into the fibers of clothes making them stiff while staining light colored clothing yellow and bleaching dark clothing light. Now, I am wearing white and light colored blouses and t-shirts to my hearts content with no more yellow stains. Before my deodorant, I only wore white when I had to, which was pretty often since I wore a white blouse as a school uniform in High School (may years ago) and worked as a waitress for years requiring a white shirt. The yellow underarm stains drove me nuts but I couldn't defeat them. Finally, I learned to have a work-shirt soaking in a bucket of sudsy water with a half bottle of hydrogen peroxide in it at all times. When I arrived home, I'd take the shirt I was wearing off and put it in the bucket and take the next day's shirt out to dry. Free at last! Now, I own all kinds of white blouses and shirts, linen, delicate cottons, silks and rayons. No yellow stains, no deodorant stiffness! Woohoo! This deodorant has made me so happy I want to share it with others. Sure, there are other natural brands but the ones I tried didn't work for me. I hope there are brands out there that do work as well as mine because there is plenty of room for all of us! 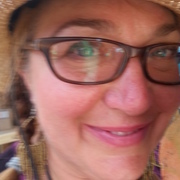 Plus, natural, hand-made deodorant makers, working together, can get the message out to more people that no one needs to put potentially harmful, cancer causing crap in their armpits to smell good 24 hours a day! Once people try my deodorant, they rave about it but getting them to try it can be difficult. I sell it at Farmer's Markets, giving out free samples just to get the word out. MANY people don't want to even bother trying it because they say "Natural deodorants don't work for me"
My deodorant is in a lotion form. Some people have asked me to make it in a stick, bar, or roll-on. I tried all three and while I do offer a roll on Mineral deodorant for those who are sensitive to baking soda, I found that nothing worked as well as the original formula. You'll find that my natural deodorant feels good on hands, dries quickly and doesn't require you to wash your hands afterwards either since it is a mild antibacterial and moisturizer. However, wiping it off on another part of your body or on a towel works too and doesn't dirty the towel either. Not only that, the deodorant is good for hands in that it contains coconut oil and other beneficial oils. The clay and tapioca I use help it to It dry out quickly so it doesn't feel wet or slimy either on the hands or under the arms. Sometimes, when I am pouring out samples and inevitably get it on my hands I just dust my hands off, sometimes I give my face a small pat down with my hands because I find my deodorant absorbs any shininess and just feels and smells nice. Even so, I thought, maybe, to make people more comfortable, I will make it in a roll on, spray or bar... I tried and tried but none of them worked as well as it does in a lotion. I am not sure why. So, I'll keep to the lotion. AS TO THE INGREDIENTS, I once told my mother the ingredients are good enough to eat. She tells me, once, when she didn't have toothpaste, she used my deodorant as toothpaste! She said it didn't taste very good but it worked! (Now I tell people, it's good enough to eat but it tastes bad and I make it for external use only). 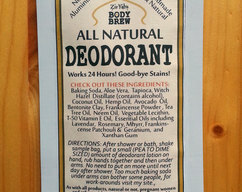 The Citrus Natural Deodorant is slightly different from my Original and Flower Garden Deodorants. This time I used used the most hyper-allergenic oils I could -although I kept the coconut oil. Natural Citrus oils on skin that is exposed to sun can cause a burn-like reaction so keep in mind to avoid exposing underarms to sun after application. My customers confirm that one bottle lasts a long time, usually over 3 months. I'm glad but worried if my business can survive if my clients only need a bottle from me every 3 to 4 months. So, you can help, if it turns out you love my product as much as other people, help me (and others) by spreading the word. Tell friends and family, give me a review, favorite me, whatever. EMILY WRITES " "This is some incredible stuff- I love your body brew. My neighbor let me try some and it works better than any deodorant I have ever used, natural or store-bought."